International Conference on Metal Material Processes and Manufacturing will be held in Jeju National University during July 19-20, 2018. Sept.20 ICMMPM2018 proceeding are now available on： here. July 3 The last round of calling for paper begins today. And the submission deadline has been extended to July 31, 2018. Please grasp the chance and submit your paper. Thanks for your support to our conference. June 7 The Fourth round of calling for paper begins today. And the submission deadline has been extended to July 2, 2018. Please grasp the chance and submit your paper. Thanks for your support to our conference. May.4 The third round of calling for paper begins . And the submission deadline has been extended to June 6, 2018. Please grasp the chance and submit your paper or abstract. Thanks for your support to our conference. May. 3 Welcome Professor Tetsu Mitsumata from Niigata University ,deliver a keynote speech on ICMMPM2018. Apr. 20 Welcome Associate professor Ewa Kowalska from Hokkaido University,deliver a keynote speech on ICMMPM2018. Apr. 13 Welcome Professor Ching-Ting Lee from Yuan Ze University ,deliver a plenary speech on ICMMPM2018. Apri.5 The second round of calling for paper begins . And the submission deadline has been extended to May 4, 2018. Please grasp the chance and submit your paper or abstract. Thanks for your support to our conference. Apr. 4 Welcome Professor Soon Hyung Hong from Korea Advanced Institute of Science and Technology (KAIST),deliver a plenary speech on ICMMPM2018. Mar. 15 WelcomeProf.Han-Yong Jeon from Inha University,deliver a keynote speech on ICMMPM2018. Mar. 5 ICMMPM2018 is calling for papers now. You can submit your paper till April 4, 2018. If you have any questions, please feel free to contact us. 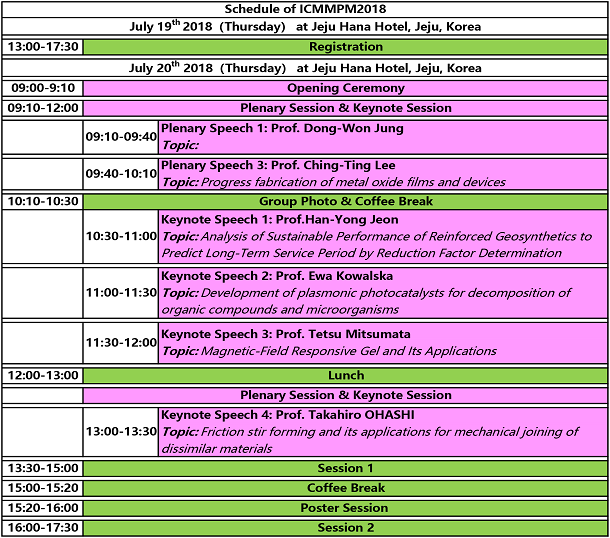 We are pleased to inform that International Conference on Metal Material Processes and Manufacturing (ICMMPM2018) will be held on July 19-20, 2018 in Jeju Island, South Korea. ICMMPM2018 concentrates on metal Material processes and manufacturing for experts and scholars in the corresponding fields. ICMMPM2018 aims to bring together leading academic scientists, researchers and research scholars to exchange and share their experiences and research results on all aspects of Metal Material Processes and Manufacturing. It also provides a premier interdisciplinary platform for researchers, practitioners and educators to present and discuss the most recent innovations, trends, and concerns as well as practical challenges encountered and solutions adopted in the fields of Metal Material Processes and Manufacturing. All honorable authors are kindly encouraged to contribute to and help shape the conference through submissions of their research abstracts, papers and posters. A "Poster Session" is a way of giving the opportunity for author who author have or achievements of limited interest and which are not suitable for the formalities of a conference to communicate their message in an informal way. ICMMPM2018 invite you take poster at conference.